Lord Charles Cornwallis, commander of British forces in the South, was initially successful in his drive against rebel forces in the Carolinas by winning a valuable, but costly victory over Nathanael Greene at Guilford Courthouse (March 1781). Cornwallis then marched his army to the coast for resupply at Wilmington, North Carolina. British progress in the South was constantly harassed by guerilla-style attacks, particularly those of Francis Marion, Andrew Pickins and Thomas Sumter. It was evident to Cornwallis that his opponents had a ready source of men and supplies in Virginia, which was then in rebel hands. 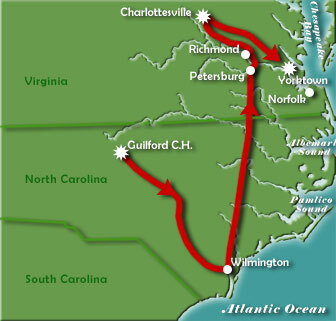 In late April, Cornwallis’s army marched north from Wilmington and arrived at Petersburg, Virginia, on May 20. His small force of 1,500 men was supplemented by another 4,000 soldiers already in the area, and later by replacements sent from New York by Sir Henry Clinton, bringing the southern army to a total of about 7,500 men. The British launched a series of raids in Virginia aimed largely at attempting to corner the crafty Marquis de Lafayette. Those efforts were not successful, but in June the British under Benastre Tarleton managed to send the Virginia government fleeing from Charlottesville and narrowly missed capturing Governor Thomas Jefferson. At this same time, Lafayette’s small army was bolstered when it was reinforced by Anthony Wayne and later by Baron von Steuben. Responding to somewhat confusing orders from Clinton, Cornwallis moved eastward toward the coast to take up a defensive position between the York and James rivers. From there he could be resupplied by Clinton or evacuated for action in New York or elsewhere. The British army arrived at Yorktown on August 1 and began to fortify its position there and also across the York River on Gloucester Point. ... National Parks of the South West of England Postaprint - Besley's Views of Cornwall - c.1854 Postaprint - Excursions in the county of Cornwall - 1824 Specialist mail order suppliers of original collectible historical antique maps and engravings.